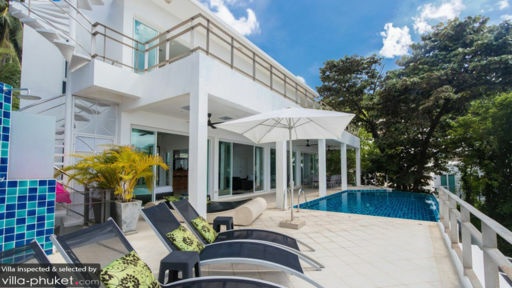 Villa Ginborn is a five-bedroom tropical paradise in Kata, Phuket providing gorgeous views of the ocean, lush vegetation, and the neighboring beaches. 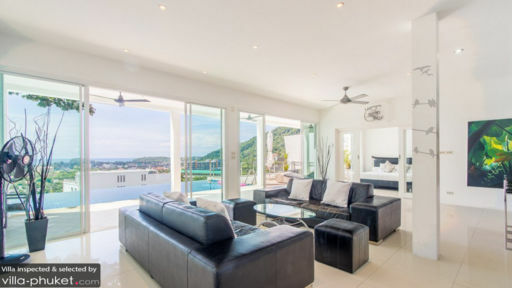 Spread over two floors, the villa has five bedrooms with two on one floor, and three on the upper floor along with the living and dining spaces. An infinity-edge swimming pool overlooking the ocean beckons as you step outside on the pool deck where you can lounge for hours simply relishing the breathtaking view. There is also a possibility to rent one more bedroom with en-suite bathroom (6 bedroom in total, 12 guests) with an extra cost. With five bedrooms in total, the villa is perfect for large gatherings as there is room for everyone. The master bedroom and two other bedrooms are found on the upper floor which provides some spectacular views of the island. The master suite is furnished with a king-sized bed and so is the second bedroom, whereas the third bedroom is furnished with two single beds that can be converted to one king bed. Each bedroom has an en-suite bathroom, and the two bedrooms are connected via a doorway making it a great family compound. The main floor at Villa Ginborn is home to the last two bedrooms which have been, again, furnished with king-sized beds, televisions, laundry, and a spacious layout for comfort. A spectacular view and an infinity-pool is everything on a tropical holiday, as you can glide in and out of the water as per your desire as there is nothing and no one to stop you from doing what you wish! There are sun loungers on the pool deck from where you can enjoy the view endlessly, lounging for hours under the parasols, with a chilled drink and a good book. A Jacuzzi and outdoor shower is there to rinse and relax besides the pool. You can enjoy the sunset right from where you are, without having to head to another location as the villa proves to be an excellent vantage point from where to view the sunset! The contemporary dining and living space at Villa Ginborn is located right next to the swimming pool and the glass doors that slide open allow you to breathe in the fresh air and enjoy naturally-lit spaces. The living area has been furnished with comfortable couches and elegant and minimal furnishings as well as white interiors. The upper floor at the villa also sports a cinema room complete with a home theatre system and comfy sitting where everyone can watch blockbuster films and enjoy an authentic movie-viewing experience. The dining area and kitchen form part of the living space and you will find an alfresco dining area beside the pool as well. The kitchen is fully-equipped with fridge, oven/microwave, wine cooler, coffee maker etc. to take care of all your needs. There is a guest bathroom as well for the convenience of guests. A breakfast bar for easy dining or quick bites is complete with barstools. Villa Ginborn is a self-catered holiday home, so that guests can have all the privacy in the world. However, there is a friendly team who is there to assist you in your stay and help you get settled in, if you need. At an additional cost, they will look after the housekeeping and maintenance so you wouldn’t have to worry about a thing! 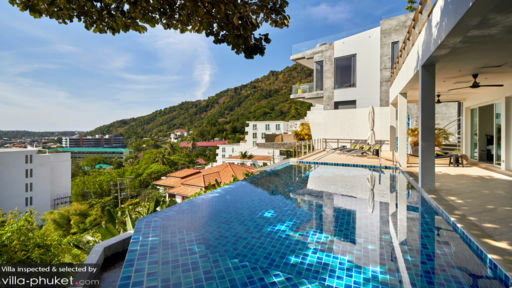 Stone’s throw from the villa is Kata beach, one of the most popular beaches in Phuket with a wide array of restaurants, shops, bars, and beach clubs for you to try! Indulge in adventure sports in Phuket like surfing, diving, snorkeling, golf etc. or travel to nearby islands for more exposure such as the popular Phi Phi islands!